The temperature's been in the 90's. 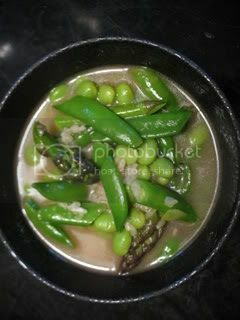 While I don't usually crave soup when the weather's warm, I DO crave fresh, healthy, light foods. And this soup really hit the spot last night. It's the cover recipe from Super Natural Cooking by Heidi Swanson. You'll be seeing a few more recipes from this book soon, as it's my current favorite. Heat the oil in a large saucepan over medium-high heat, then add the shallots & garlic and saute for a couple of minutes until soft. Add the rice and cook, stirring, for one minute. Add the stock and bring to a boil. Cover, lower the heat, & simmer until the rice is just tender, 35-45 minutes. 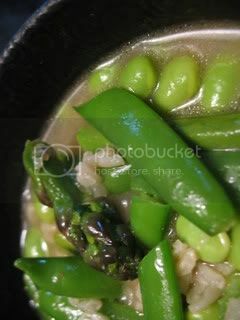 Add the sugar snap peas, asparagus, and edamame. Season with salt & pepper. Simmer for 2-3 minutes. Serve immediately while the veggies are still crisp and bright. You can add any herbs or seasonings you'd like and top this soup with shredded parmesan cheese or a drizzle of toasted sesame oil. We actually had this for dinner last week - totally awesome! !